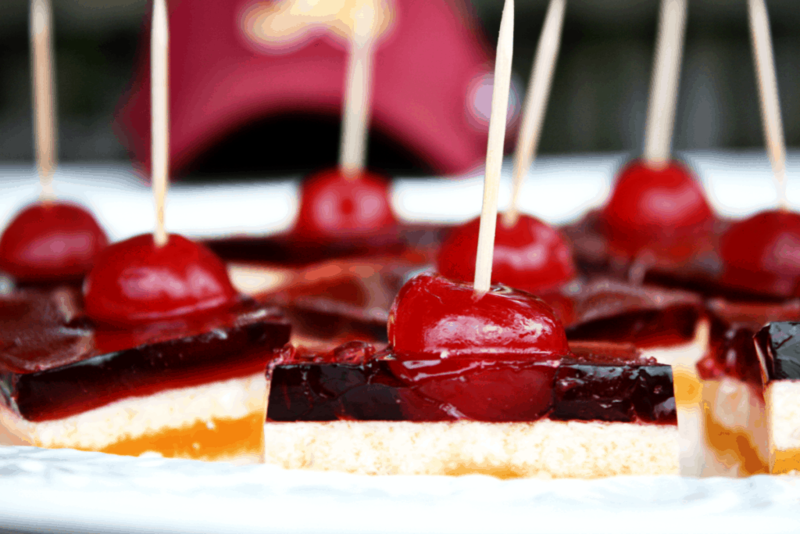 Washington Redskins Themed Jello Shots! The 2015 NFL Football Season starts tonight!! The Steelers and the Patriots will battle it out to kick off the season! And, this Sunday? Pam’s and my FAVORITE professional football team, The Washington Redskins, will kick off their first game against Miami at home! Pam and I have been Redskins fans since, well basically since we shared a womb! We were born and bred Skins fans! We have such great memories of Sunday afternoons – our whole family sitting around the TV rooting on our Washington Redskins! Just the sound of a football game on TV, but especially the Redskins, takes me back to those “good ole days”. As we got older, Pam and I started going to the games at RFK Stadium. I’ll NEVER forget that stadium literally rocking with fans screaming, “WE WANT DALLAS! 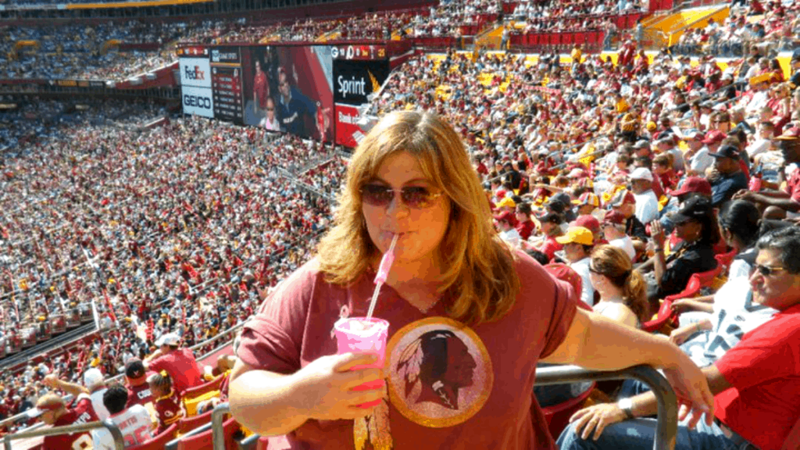 !” I would have chills all through my body – LOVING the camaraderie of cheering for our team with so many Redskins fans! And, singing “Hail to the Redskins” along with 45,000 other fans and The Washington Redskins Marching Band? Don’t get me started – some of the best times of my life! SO, when I was thinking of what I could write about for this week’s “Thirsty Thursday” post – it was a no-brainer for me! 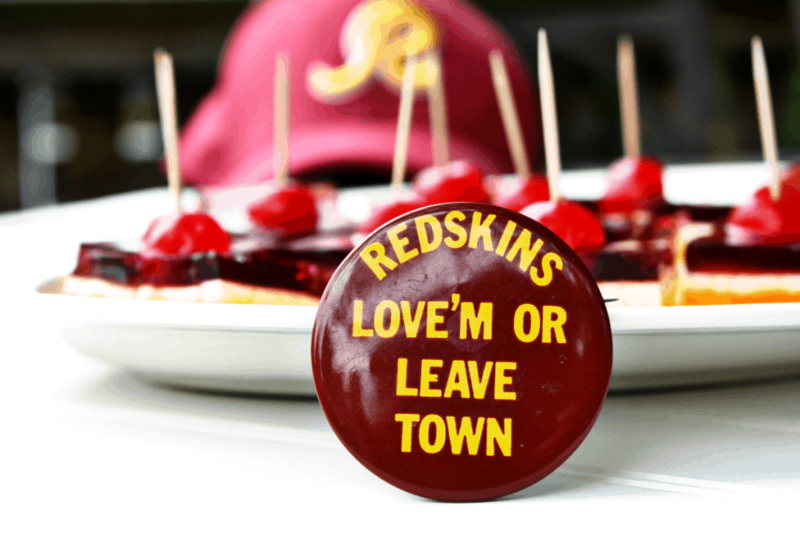 I searched in Pinterest for “Redskins Cocktails”. One creation caught my eye immediately! 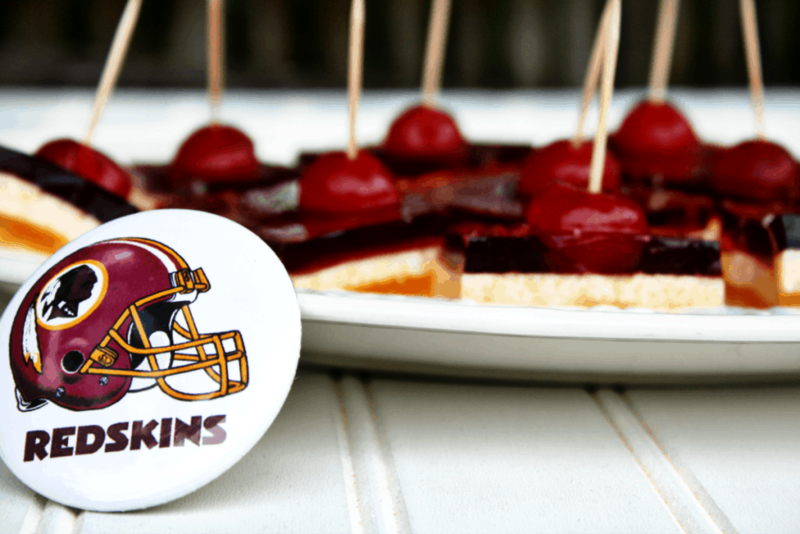 “Washington Redskins Jello Shots for Darcie” on an AWESOME blog called That’s So Michelle! This girl is basically a ninja when it comes to creating Jello Shots! She even wrote a cookbook called “Jelly Shots” with 70 different recipes! I just HAD to make these! Here’s the recipe, with some changes that I made to it! 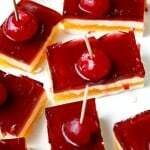 1 box Black Cherry Jello 3 oz. 1 Box Lemon Jello 3 oz. Step 1: Pour 1 cup milk or cream in a medium sized sauce pan. Sprinkle 2 envelopes Knox gelatin on top and let it sit for one minute. Whisk until combined and turn on medium heat. Add 4 tablespoons sugar and whisk until combined. Bring to a light simmer. Add 1 cup cold vodka. Pour into a lightly greased 9x13 pan. Refrigerate for at least 30 minutes or until firm but still a little sticky (I needed to keep it in the fridge for 45 minutes to reach proper firmness). Step 2: Pour 1 box lemon jello and 1 cup water in a medium sized sauce pan. Sprinkle 1 envelope Knox gelatin on top and let it sit for one minute. Whisk until combined and turn on medium heat. Bring to a light simmer. Add 1 drop of red food coloring (no more than that, one drop makes the perfect color, two drops makes it orange and we don't want that) Add 1 cup cold vodka or alcohol of choice. Allow to cool before next step! Pour on top of the White layer and refrigerate for at least 30 minutes or until firm but still a little sticky (again, I needed to keep it in fridge for 45 minutes). Step 3: Slice 12-15 cherries with stems in half so the stem is on top. This way they will sit flat in the jello shot. Step 4: Pour 1 box black cherry jello (black cherry is the perfect dark red/burgundy color) and 1 cup water in a medium sized sauce pan. Sprinkle 1 envelope Knox gelatin on top and let it sit for one minute. Whisk until combined and turn on medium heat. Bring to a light simmer. Add 1 cup cold vodka. Let it cool before next step. Step 5: Pour on top of the yellow layer. 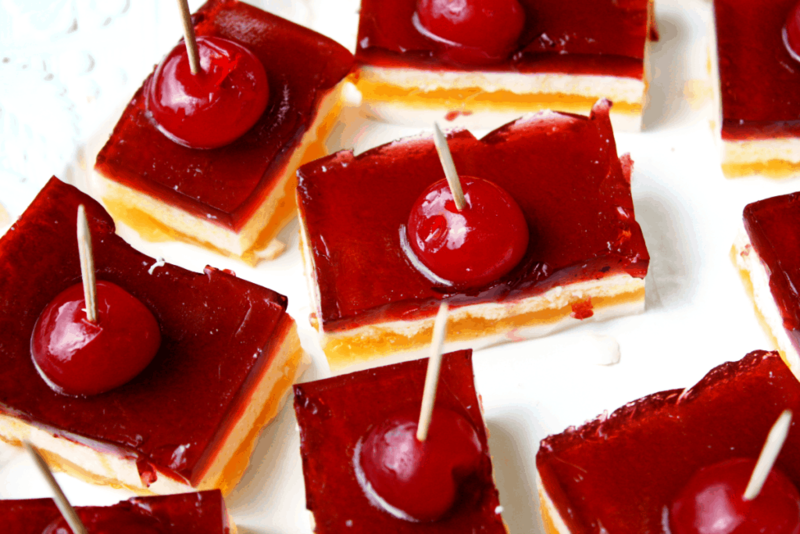 Place cherries into the black cherry jello layer in rows of 5 or as many as you can fit for the shape you want to cut out. Refrigerate for at least one hour or until firm. Step 6: Using a mini cookie cutter or fondant cutter or knife cut out your shots around the cherries. Cut out additional shots (they just won't have cherries) with the left over jello. It's easiest to cut out strips of jello (vertically down the pan) and lift them out before cutting your shots. Make sure to lift out each strip in one piece. Place them on a cutting board and make uniform bites. I ALMOST turned this post into a “Pinterest Fail” post – BUT I was so pleasantly surprised the way these turned out! 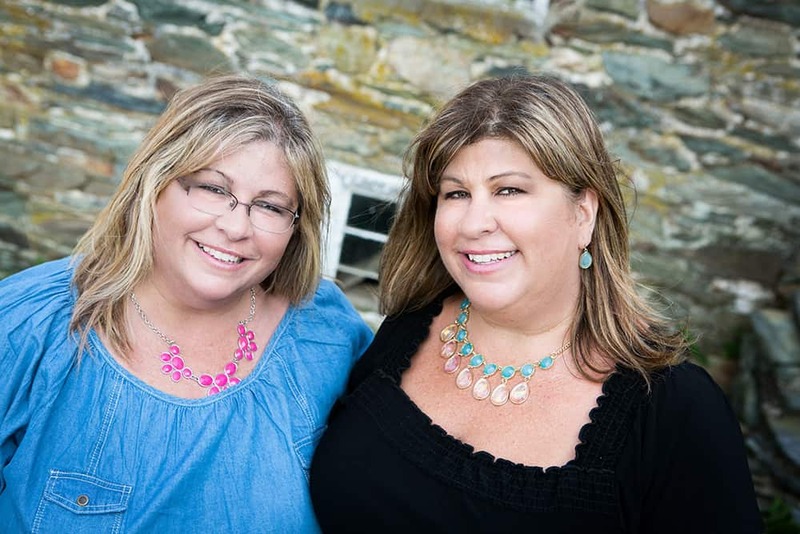 Not gonna lie – Michelle’s look MUCH better than mine, but hey – she’s like a Jello Shot Master! So, I think I did pretty good! Keep in mind, though, these bad boys are LOADED with vodka. So, cut them into smaller, bite-sized squares than I did! Each bite-sized piece would probably be like taking a shot of vodka. Enjoy the kick-off of the 2015 NFL Season, and PLEASE drink responsibly! As for me – HTTR Baby!!! Who’s YOUR favorite team? Yes they were! They were the glory days for sure!! !